Germany loves its festivals. During summer months, you can’t throw a rock without hitting a new festival. And a German wine festival is a sight to behold. Or, rather, an extravaganza for all of the senses to behold. If you’re looking for happy people, interesting if not great music, refined festival cuisine, and every nuance of German wines, it is a destination for you! 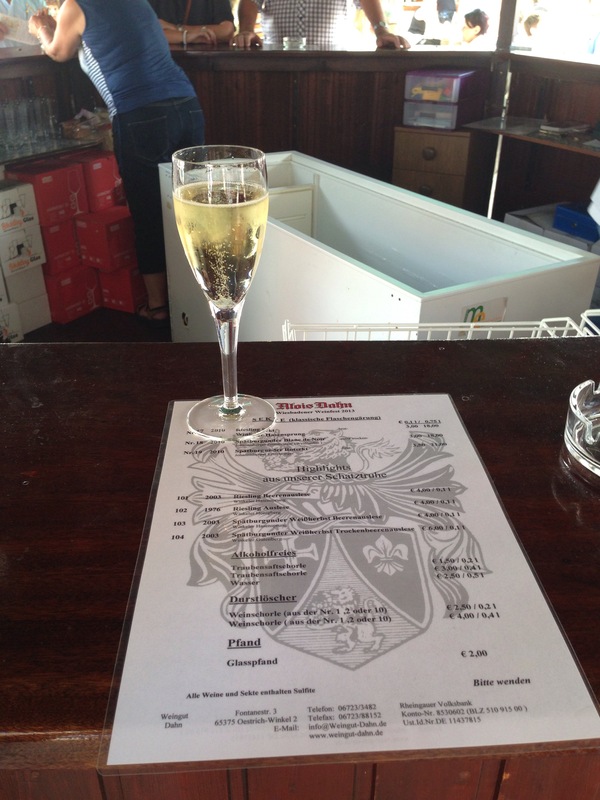 A few years ago, I had the unexpected opportunity to go to the Rhinegau Wine Festival in Wiesbaden, Germany. A must-visit destination in its own right, Wiesbaden is a historical and architectural jewel and the formal capital of the central state of Hesse – and not, in fact, the larger, commercial hub of nearby Frankfurt am-Main. Near the confluence of the Rhine and Main rivers, it was an international spa capital in the 19th century and about 75% of the city was spared destruction by Allied bombs in World War II. For about two weeks each August, Wiesbaden’s central Schlossplatz (transliterated) is transformed by over 100 booths, carts, and stages to house the Rhine River viticulture area’s best wines and foods. If you’ve ever been to a wine festival, you expect something like that, but the Hessians take it to another level. Booth after booth proudly sells wine by the taste, glass, or bottle (oh yes, you pay for each sample) of each winery’s selections. Never have I ever seen so many nuanced variations of Riesling and Gewürztraminer wines, both still and Sext (sparkling). Once you start trying them, you realize how magnified the difference in dryness, residual sugars, vintages become when wines are sampled side by side. 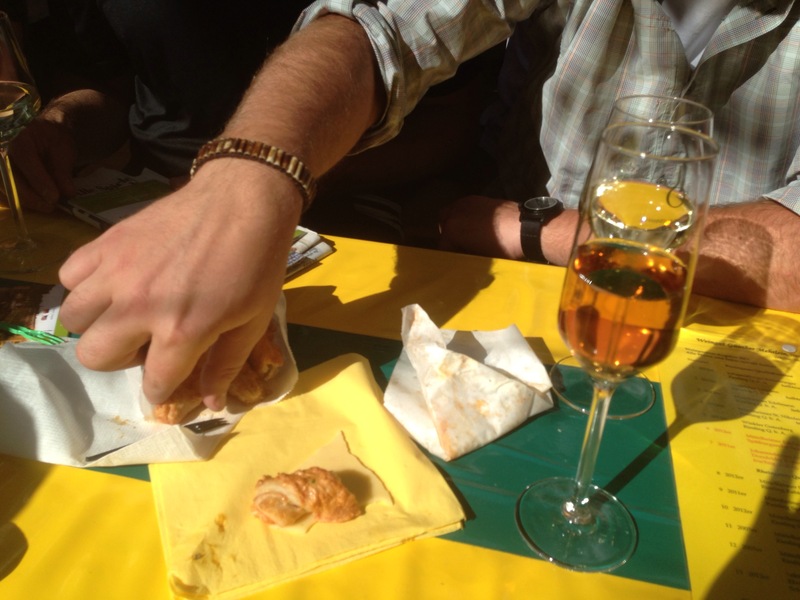 You also quickly realize that you’d better eat the delicious food to pace your sampling. This excursion included a group of several friends, and one had the brilliant idea that after every wine stop, we must eat something. This just caused us to eat and drink more overall, but it was worth it. Never before and since have I had such excellent festival food. Instead of hot and corn dogs, funnel cake and fried Oreos that you find at American festivals, German festivals go gourmet. Ok now, lest I categorically give the USA an Ariana Grande-style bad rep, I do recognize that food trucks with lobster rolls, chicken and waffles, gyros, vegetarian fare, and even Asian dumplings are not abnormal at America’s festivals and fairs these days, but they’re not commonplace either. Nevertheless, other than the expected wursts (bratwurst, rindswurst, etc. ), the Germans do justice to regional and international fair food. Flammkuchen was one of my favorite food discoveries in Germany. A cross between a baked pizza or flatbread and a flaky puff pastry or phyllo, it is topped with a creme fraiche-like substance and assorted other toppings. Prosciutto (or speck – thick, fatty bacon) and caramelized onions are the most traditional toppings, but arugula and shaved Parmesan will satisfy vegetarians. 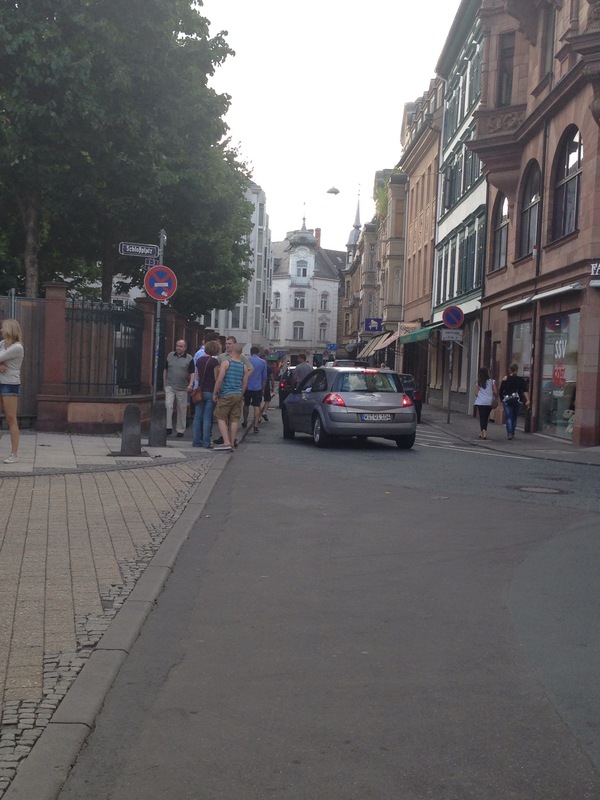 Wiesbaden wasn’t my first experience with Flammkuchen, but it certainly was one of my most memorable, as my friends and I laughed and soaked in the wine and culture. Cheese and charcuterie boards with pate, sweet and savory crepes, and Germany’s ubiquitous fresh, cheap bread and soft pretzels all helped us balance and enhance the wines. In one afternoon, we developed a much better understanding and appreciation for the quality of Rheingau wines. 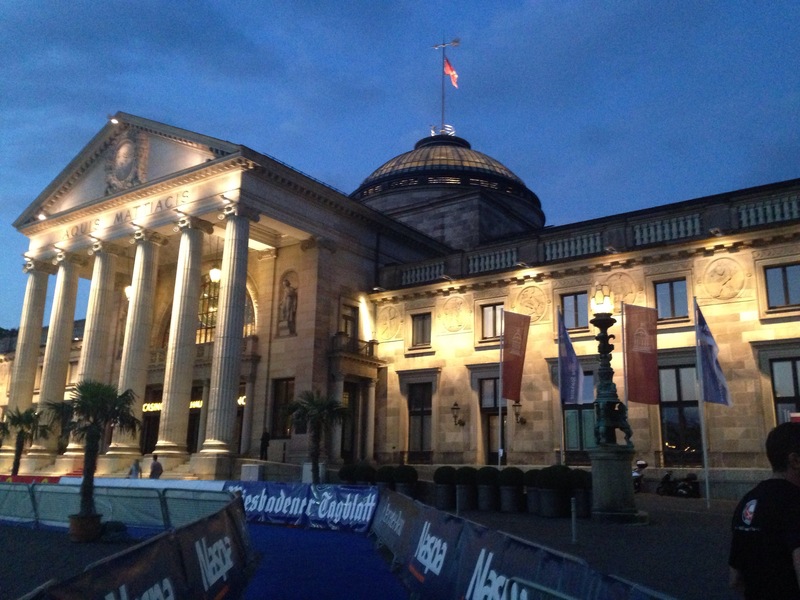 The backdrop of charming Wiesbaden was an ideal setting for this smorgassbord and social event. If you ever travel to Germany during the summer months, make it a point to try out a wine festival. I enjoyed this and others better than the overhyped Oktoberfest, to my own surprise. It is an experience that I will never forget and will always cherish.